CNN called virtual reality the new open house and it’s easy to see why. Buyers never need to get in their car for Saturday open houses. Now they can see the space on their schedule from anywhere in the world. Think about its implications for showing real estate to foreign buyers and busy business professionals. The time saving and selling potential through VR for real estate agents is incredible. VR has been especially useful in commercial real estate for spaces that don’t exist yet. Buyers often struggle to visualize a space when it’s a jumbled mess of slab and pipes. Now developers transform those flat renderings and make it possible for potential investors to walk through the finished product months before ribbon cutting. Some platforms can add a company’s logo and branding into the virtual environment. Talk about selling the space! It’s incredibly easy to use virtual reality with the latest innovations. Take Matterport’s Core VR system. The industry leader takes real-world spaces digital starting with the mobile-friendly Matterport Pro Camera. Spaces are scanned and mapped in minutes, with a typical property being completed in an hour. When uploaded to the cloud host, users can program measurements, add descriptions, and generate a guided tour. Real estate companies share the 3D mapped space with clients by embedding 3D spaces into their website and mobile spaces. Clients can tour online or take the product to the next step with a VR headset. When the headset is plugged into a mobile device, users are immersed into the 3D Showcase. The Matterport VR Showcase is compatible with Gear VR and Google Cardboard. Matterport is by no means the only RE tech company jumping on the VR trend disrupting the industry. 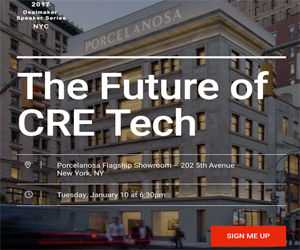 While not exclusively focused on real estate, through the YouVisit website users tour properties represented by Douglas Ellman and the Corcoran Group. The tours are further using a VR headset and mobile compatible app. VR Global integrates 2D/3D 360-degree photos and video, 3D models, and CGI into VR environments for commercial, mixed use, and residential properties. The providers update 3D rendered models into tourable space available on web, mobile, augmented reality, and VR devices. As virtual reality technology becomes more affordable and accessible, expect to see it expand beyond luxury and large-scale commercial developments. The technology is already transforming how people buy and sell real estate. We expect VR systems to be one of the Top Real Estate Trends of 2017.